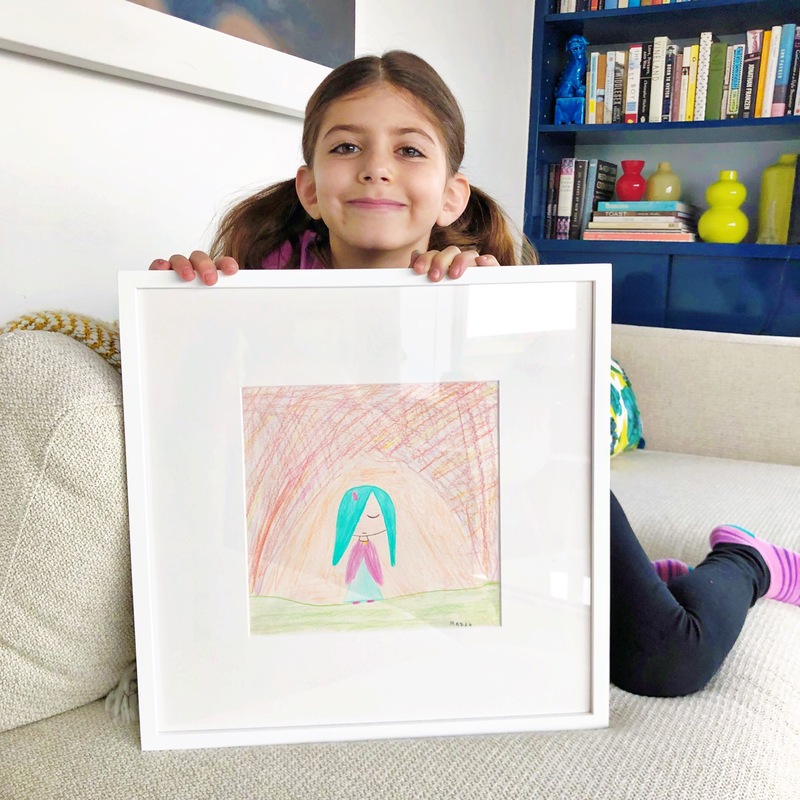 Do you remember last year when Mazzy sold her drawing at an art auction for $800 to raise money for pediatric cancer research through charity called Cookie for Kids’ Cancer? If not, you can read all about that awesome night here. This year, Mazzy was asked to be part of the auction again! A few weeks ago, we took out a bunch of acrylic paints, a canvas and a drop cloth and Mazzy got to work. I think her painting was inspired by some of the more graphic pop art pieces she saw at the auction last year. She named it “Happy Ice Cream” and I was all set submit it for the big event. Then a week later, she came home from school with a clock she made in woodshop. It was a weird shape with drawings of all her favorite things— Pusheen-looking cats, Mr. Egg (aka her version of Gudetama) and “Yasss Queen” rainbow cloud. It was freakin’ awesome and looked like she put a ton of hard work into it. I told her I would be hanging it up prominently in our home. I told her I didn’t want her to submit the clock, because I loved it, but she was insistent. We ended up getting into a little fight about it and I asked her why she wanted to sell it. She said because she thought it would raise more money for the charity than her painting. I said that was an excellent answer, but the clock was so awesome that selfishly, I wanted to keep it for myself. For the record, this is the first time that a child of mine has actually wanted to get rid of a piece of their art work and I said no! That’s when I finally understood. Having your art up on the wall for a big grown-up event is a huge deal. She hadn’t put that much time into her painting and didn’t feel like it represented what she could do, nearly as much as her clock. Last year, the response she got from her cityscape drawing was a huge confidence boost and she wanted to have that same experience. Mazzy went straight over to a small pile of art work that I currently have stacked in our living room; it includes a few special pieces that Mazzy and Harlow have made over the years, which I have set aside to frame for a new gallery wall I want to hang in our hallway. She picked up one of my favorites— a girl standing with her eyes closed against a sunset. I had to agree, it was an excellent choice. We named it “Quiet,” framed it and I submitted it for the auction. I also took a picture of it, so I could still print it and hang it in our hallway. The auction is tomorrow night and she says I’m not allowed to bid on it. If you’d like to bid on Mazzy’s piece online, or any of the other art up for auction, you can do so here. I can relate. Three years ago, my 13 year old step daughter brought home a beautiful painting she did in school. She told me she was giving it to her grandpa for Christmas. I was surprised and asked her why she wanted to give the painting to him and she told me that she had presents for everyone else but him. She figured she give him that instead of having to find something else. I wanted to keep the painting so I offered to have a photo of her enlarged and framed so she could give that to him instead. She was fine with it and I got to keep the painting. I am positive he is enjoying the photo of her more than a child’s painting so that helps me feel less guilty when I look at the painting every day in my kitchen.